In September 1989, numerous constitutional amendments were passed by the Assembly of the Socialist Republic of Slovenia, which introduced parliamentary democracy to the country. The same year Action North united both the opposition and democratized communist establishment in Slovenia as the first defense action against Milošević's supporters attacks, leading to Slovenian independence. The word 'Socialist' was removed from the name of the then state on 7 March 1990. The socialist infrastructure was largely dissolved. The first open democratic election was held on 8 April 1990. The parliamentary elections were won by the opposition, known as the DEMOS coalition led by the dissident Jože Pučnik. At the same time, Milan Kučan, the former chairman of the League of Communists of Slovenia (ZKS), was elected President of the Republic. The democratically elected parliament nominated the Christian Democratic leader Lojze Peterle as Prime Minister, which effectively ended the 45-year-long rule of the Communist Party. During this period, Slovenia retained its old flag and coat of arms, and most of the previous symbols as it awaited the creation of new symbols that would eventually come after independence. The old national anthem, Naprej zastava slave was however replaced by the Zdravljica already in March 1990. 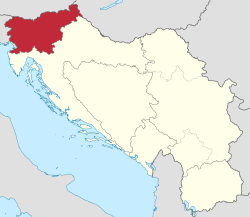 On 23 December 1990, a referendum on independence was held in Slovenia, at which 94.8% of the voters (88.5% of the overall electorate) voted in favour of secession of Slovenia from Yugoslavia. On 25 June 1991, the acts about the Slovenian independence were passed by the Assembly. Following a short Ten-Day War, the military of Slovenia secured its independence; by the end of the year, its independence was recognized by the wider international community. ^ "Slovenia". worldstatesmen.org. Retrieved 3 February 2016. ^ "Historical Circumstances in Which "The Rally of Truth" in Ljubljana Was Prevented". Journal of Criminal Justice and Security. Retrieved 4 July 2012. ^ Greif, Gregor (2006). Posledice ustavnih izbir in demokratični prehod v Republiki Sloveniji [The Consequences of Constitutional Choices and the Democratic Transition in the Republic of Slovenia] (PDF) (in Slovenian). Faculty of Social Sciences, University of Ljubljana. ^ Flores Juberías, Carlos (November 2005). "Some legal (and political) considerations about the legal framework for referendum in Montenegro, in the light of European experiences and standards". Legal Aspects for Referendum in Montenegro in the Context of International Law and Practice (PDF). Foundation Open Society Institute, Representative Office Montenegro. p. 74. Archived from the original (PDF) on 2012-04-26.